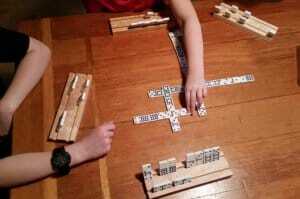 Domino Games with longer instructions include a link to a page with instructions. Choosing a Domino Game Sets: When you go to buy a set of dominoes you will find several options. There are Double-Six up to Double-Eighteen sets of dominoes. You can really use any set for any game. I found that a Double-Nine set is the best for when we are playing with a group of 3-5 people. I can use the whole set or easily pull out all the 7-9 dominoes and to have a double-six set. Most sets will come with a train station piece for playing Mexican Train. Why Domino Racks? 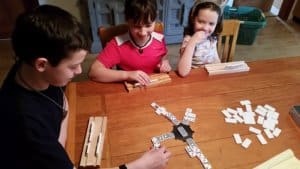 Domino Racks are a perfect addition to any domino set. Though they aren’t required for playing, they take out the frustrations that domino players can face. The Biggest reasons domino holders are recommended is…1) one person knocks the table and down go all the dominoes.. (with kids, I can’t tell you how many times they hit the table) AND 2) little ones or those with fine motor coordination challenges don’t always have the hand coordination to balance them on their side very well. Domino Holders solve those problems. House Rules: Just a heads up, because you play one of these games by the rules below doesn’t mean everyone uses the same rules. This is really common when playing Mexican Train. 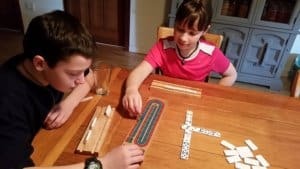 We have what we call “house rules” for Mexican Train and anytime we have someone over to play we clarify those “house rules” . When we go to someone else’s house we play by their “house rules”. Other games we typically negotiate as we go. How many tiles to draw, if doubles need to be “satisfied”, if doubles are spinners, when the game officially ends and how many points are needed to win is all flexible to negotiate at the beginning of a game. Just have fun with it. Here are 10 of our Favorite Domino Games to play with the kids. This one is my girls favorite. It is a game of chance. Good for Preschool and older. Blind Hughie Rules and Directions. 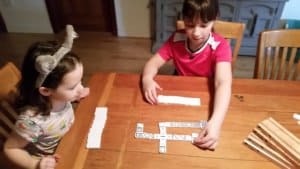 A simple block style domino game. Matching and no math. If you have dominoes with colored pips (that is the name of the little dots on the dominoes) even a preschooler can play this one. 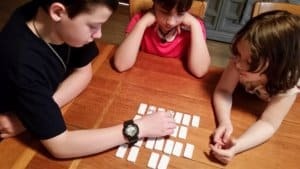 A great game for grade school age kids. A little bit of math and some strategy. This one is my favorites. 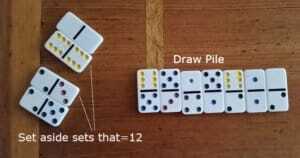 It can be played with any domino set. It is a mix of chance and a little bit of strategy. I love to play this on with a bigger group and a double-twelve set of dominoes. We use a Double-Nine Set when we play in a smaller group. Can be played with preschool age and older. 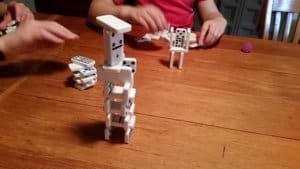 A fun, free-form, block-style domino game. Easy to learn and very simple rules. Perfect for all ages, even little ones. This is a good one for a child to play alone (especially if they are just learning addition) or with an adults assistance. Uses a Double-Six set of Dominoes. This game is a lot like the card game concentration. This game uses a set of Double-Six Dominoes. All tiles are placed face down, shuffled and in put rows. The players have to find two dominoes that add up to 12 if the two tiles they pick do not have pips adding up to 12 then they are flipped back over and it’s the next persons turn. If they find two that add up to a total of 12 pips then that player gets to go again. Player with the most matches in the end wins the round. This game is simple and fun. Begin by making a platform of 3 or 4 dominoes. Players take turns adding dominoes to the platform with the goal of making a tower stable enough to survive their turn but precarious enough to fall for the next player. If the tower falls on your turn you loose and the game starts over. Lots of giggling and shouts of laughter and surprise involved. This is simple but one of our favorites. I think most of our domino games ends with this or Tower Building. I love this one because it teaches the kids spacial recognition and cause and effect without being labeled “educational”. We had just as much fun when we failed. Add levels and curves for added challenge. Here is some of our play. Just a little video. Funny how simple play can bring joy and laughter. What kid (or adult) doesn’t love to build with dominoes? It holds immense satisfaction. They are pretty easy to stack and when you knock them down they make a fantastic crashing noise! We like to see who can make the highest tower or we build several and then flip pennies at them to knock them over. These are all great games. I encourage each one of you to go get a set of dominoes. Along with a deck of cards, Dominoes are the most versatile game out there. 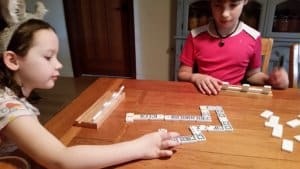 Domino Racks are also a great addition to a domino set. 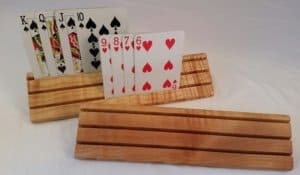 Check out our Domino or Playing Card Holders HERE. They make game playing with kids MUCH more enjoyable. 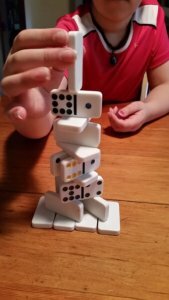 Dominoes have a tendency to be toppled over during a game and this simple tool prevents that frustration.